Styled with faux wrap skirt . The fuzziest, softest, loftiest baby alpaca you ever did meet. Slip into this plush crew neck and prepare for hug requests and arm grabs all day long. Lovely sweater, I like the colour and the shape (great with high rise pants or a skirt). The only negative I find is that it is very stretchy, it is a bit tight on the arms and I wish it would have less nylon. 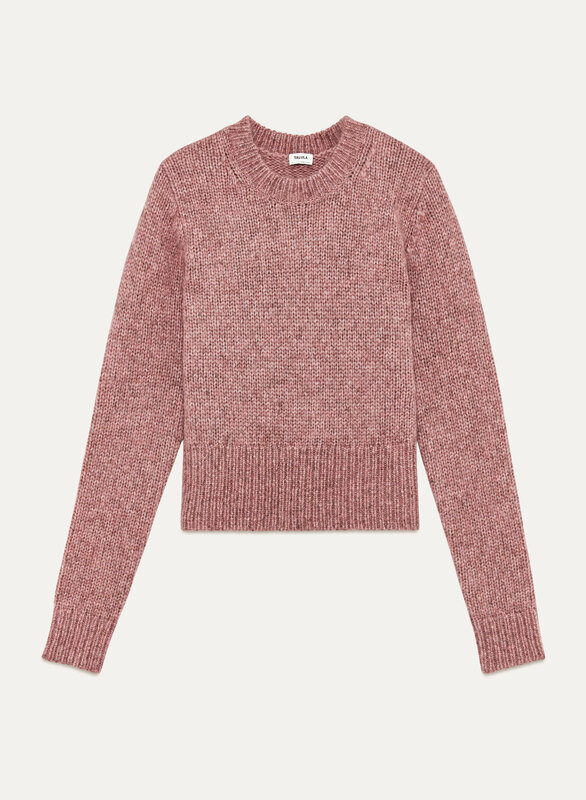 I love this sweater, easy to throw on with jeans or wear to work. The sweater does shead mildly. Loved this sweater, so soft and lovely but had to return it as it was shorter than I thought. Please make it in a longer style. Because it’s short it doesn’t make it slim....I thing it’s makes you look chubby...I liked the soft feel and warmth of soft wool. Beautiful colour - nice fit! I love the colour and fit, although it is a bit shorter, it looks great with high waisted pants or a skirt. This sweater is incredibly warm. It hits right at the waist. It does shed quite a bit especially when wearing black bottoms. I got this in grey and it's a great colour. The sweater is soft as expected. Just a note - It is quite short so it’s best worn with anything high waisted, which I don’t mind.